So I’ve now had my Saucony Kinvara’s for nearly 3 weeks. They are minimilist trainers which is kind of a halfway house between traditional trainers and barefoot. Previous to wearing my Kinvara’s I’d been running in Brooks Ghost 4 with orthotics prescribed by my osteopath. I got some great advice about how to transition from normal shoes into minimilist ones from the shop where I bought my Kinvara’s and I’d also done a fair amount in internet research. One of the most useful articles I found was this one in the Running Times which explains how the body needs to adapt when you start running in minimilist or barefoot shoes and what you can do to help the transition. One of things I’ve heard about most when people transition is about pain in the Achillies tendon or calf muscles. The article explains that when you run in a ‘normal’ shoe your foot is actually in a plantarflexed position — in other words, your toes are pointing downward and your Achilles tendon and calf muscles are in a relatively shortened position. So when you suddenly start running with a lower heel in mimimilist or barefoot shoes you force your Achilles and calf muscles to operate in a lengthened position. For many people that can mean tightness and pain, for some it can result in injury. The article goes on to suggest exercises that you can do to improve flexibility in the calf and Achillies to ease the transition. It also goes on to talk about foot strength and form – two other really important areas when you start minimilist running. So over the last 3 weeks I have started my transition – I have run 3 times a week starting with short distances of 1.5 to 2 miles. My first impressions of the Kinvaras are that they are very comfortable indeed. 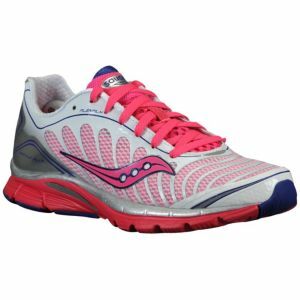 They are very ‘bouncy’ and cushioned under the midfoot which makes for a very comfortable run. I was immediately aware of my heel being closer to the floor – thankfully my natural running style is to land midfoot so heel striking has never been an issue, but these shoes would definitely make it more difficult to land on your heels. On my first few runs I was definitely aware of my calves feeling tight and some ‘pulling’ in my Achillies towards the end of the run, so I have been careful and followed the advice – leaving days in between when I run and stretching the affected areas. I’ve gradually built up my mileage to a 5K after a couple of weeks but have kept most of my runs to a maxiumum of 2 miles so far. It seems to have worked well for me as this morning I did my first non stop 4 mile run in the Kinvaras with no calf or Achillies pain at all. I really do enjoy running in these shoes, I am more aware of what I’m doing with my feet, I feel lighter as I run and very importantly given my recent injury my ankles feel supported and I’ve not once worried about going over on them. To help with my form I’ve been using some Chi Running techniques following a workshop that I went to a few weeks ago- I’ll write a separate post about that later but it’s definitely helped with my transition. So now I get to start increasing the mileage – not in great leaps and bounds but I have the 10 mile Great South Run to train for in October and after this morning’s run I’m now feeling really good about it and looking forward to running it in my lovely Kinvara’s! It`s great that you love your new shoes so much! I`m looking into new trainers too and want to jump onto the minimalist bandwagon finally. Are you considering going even further and try barefoot running (say in vibrams)? Maybe. I think I’ll give it a while in the Kinvara’s first though to let me legs get used to it. I’m actually going to try out some Vibrams with Diary of a Dashing Fashionista on Thursday at a Vibram clinic so I’ll report back on how I get on. I really do love the Kinvara’s though – and it helps that they’re pretty! Sounds fun! Definitely keep us updated on that! Hi.. I’m doing extensive research on the exact case. Did you keep your orthotics in the kinvaras & are you fully transitioned to minimalist shoes? I purchased the kinvara 5. Thanks for the reply.. I have tried twice to transition & had to stop with PF pain.. Will try again when it clears up!